Oil on canvas, 35 x 42 cm. A herdsman sits by a river, fishing. Behind him are two sheep and a lamb, together with a cow slaking its thirst and a bull bellowing across the river. In the background, a goat has strayed off to a tongue in the lake by a willow tree. The rest of the animals are resting by a hut underneath the shade of the trees. The diffuse lighting, idyllic landscape and fishing herdsman is reminiscent of the Roman poet Vergil’s description of Arcady; a landscape populated by herdsmen wherein prevailed a paradisiacal state of innocence and bliss. The Dutch painters’ inclusion of herdsmen in their landscape paintings served a dual purpose: to give the viewer a sense of the size of man vis-à-vis nature and to convey the idea of man in harmony with nature. 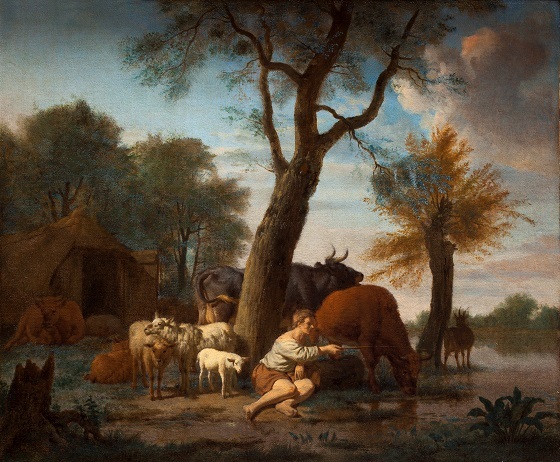 Adriaen Van de Velde often depicted carefree herdsmen in scenic natural surroundings, with Nicolaes Berchem and Karel du Jardin’s paintings of pastoral life in Arcadian landscapes as a continuous source of inspiration for his own work in that genre.